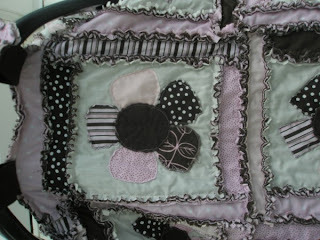 UPDATE: This was the first rag quilt car seat tent that I made. I still look back on it fondly! It was my daughters. The colors may not be the style for today, but I love it! Sorry about the sideways picture. Gah! When my daughter was first born my mom and I were walking through Walmart with the Cream Flower blanket over the top of my car seat. I did not want people to see that my baby was only a couple of days old and I wanted to keep her as safe as possible from germs etc. People were stopping and staring at the car seat and asking if I made it. 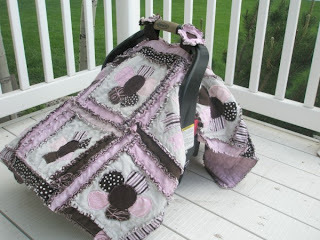 It gave me an idea to convert the blanket into a cover for the car seat and later the blanket will be used in the stroller and whatever else suits our fancy. 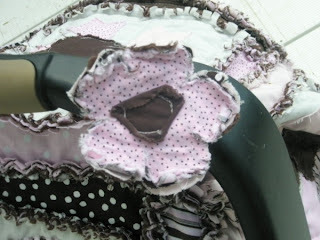 I love the flower where the cover attaches to the car seat. It's a beautiful detail.